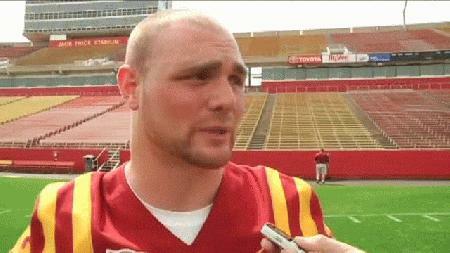 Shirts With Random Triangles: Iowa St. RB Jeff Woody wants Iowa St.-Iowa rivalry to continue. Iowa St. RB Jeff Woody wants Iowa St.-Iowa rivalry to continue. Iowa St. RB Jeff Woody. Image via KGAN-TV. Iowa State running back Jeff Woody hopes that the Cyclones' in-state Cy-Hawk Series rivalry with Iowa doesn't go the way of longtime rivalries like Miami-Florida, which ended this past weekend, or like Michigan-Notre Dame will next season. Concern for the in-state rivalry is real, considering that the two schools are in separate conferences (Iowa St. in the Big 12, Iowa in the Big Ten), both of which will be expanding to nine conference games schedules in 2016. The current deal between the two schools ends in 2017, but neither school has discussed publicly about ending or any alterations to the annual series. Iowa plays Iowa St. for the CyHawk Trophy at home on Sept. 14. The Cyclones have won the past two games in the series. It will be the last Cy-Hawk Series game for Woody, who is a fifth-year senior.